There were indeed many plaid and tweed pieces, mixed with a variety of textures and colors as above. As usual, lots of wearable separates were offered with infinite mix and match potential. Silhouettes were decidedly longer with a slight retro 70s vibe. I feel like I had something along these lines in my closet back then. It’s an easy comfortable look allowing for many different stylistic interpretations depending on what direction you want to take it – from Boho chic to casually elegant or anywhere in between. This reminded me of those classic YSL velvet suits with jabot blouses. As with the other collections I’ve covered, there was a wonderful variety of layering opportunities with great jackets, vests and coats that mixed a variety of materials. Witness this fabulous patterned collaboration of plaid, leather and fur. Take it apart and wear any of the items with what you already have in your wardrobe. And this is the commercial genius of Tory Burch – stylish, practical, wearable and affordable! Same skirt with a fabulous shearling vest and silk blouse. And for those of you who don’t like so much pattern, don’t worry – there are things for you like the neutral look above or this fabulous black outfit, capturing the essence of the collection with proportion, texture and mix of materials. I may have to have the trapper hat – one of the best I’ve seen. And although I’m not a huge fan of the lace, the long maribou vest is a knock out!! Wear it with absolutely everything! The stars of the collection, however, were the beautiful pleated palazzo pants. You of shorter stature will have to be careful with this look but the tall girls out there will find that a pair of these could be an indispensable addition to your wardrobe- dress them up or down, with tweed and plaid for day or silk for easy evening out or holiday party at home. Wide is definitely the word for pants this fall. And of course, lest I forget to mention, there was the usual Tory array of terrific shoes, boots and bags with a few new shapes and styles. So does this collection have the exquisite tailored vision of Derek Lam or the elegant flowing feminine appeal shown at Lela Rose? No, but does it offer versatile, stylish, affordable pieces that almost everyone can find a place for in their wardrobe? You bet! This entry posted in fashion. Entry Tags: Fashion Trends Fall 2011, New York Fashion Week Fall 2011, Tory Burch, Tory Burch Fall 2011 Bookmark the permalink. So many fabulous pieces and I love the ones you mention, mixing and matching it up ! So great! Great NYFW coverage this week! Love all the mixes of color/pattern/texture combined with those 70’s bow tied blouses. I love your picks. I’m loving that last skirt with the built in low slung belt! Perfect for a California Fall! I agree, it has been so fun to see a thorough breakdown of several shows instead of a wide gloss over of everything. Lots of wearable things here but, I can’t help but say it–that red velvet tux is a DIRECT copy of Tom Ford’s for Gucci in one of the collections that put him on the map! Love this collection…a tiny bit RL to me….but I am still loving the Lela Rose collection so much! Always fresh, always wearable! For me, that sums up TB and that’s why I love her! And that shearling coat…wowza! I love alot of her mix it up and match it clothes, not to mention the boots – yummy! Each and every piece is elegant yet wearable – that’s what makes TB such a fashion “must” in everyone’s wardrobe. Love how she was inspired by English Country as that’s the direction we’re going for our new collection! What a good selection you’ve shared! I like many pieces, but I love the all black outfit – the sheer top, the coat and the skirt. and, yes, the trapper hat is great. Have a great day! love tweeds and all the textures…gorgeous garnet colors….the drape of the skirt…the layers and of course, black..that being my favorite…beautiful show..
Oooou that maribou! How fabulous is that. Being a big vintage clothing fan, I love how her pieces are so timeless. I swear that plaid number, the burgundy velvet suit AND the red tweed jacket are all items my mom wore when I was little! Down to those buttons. Groovy! 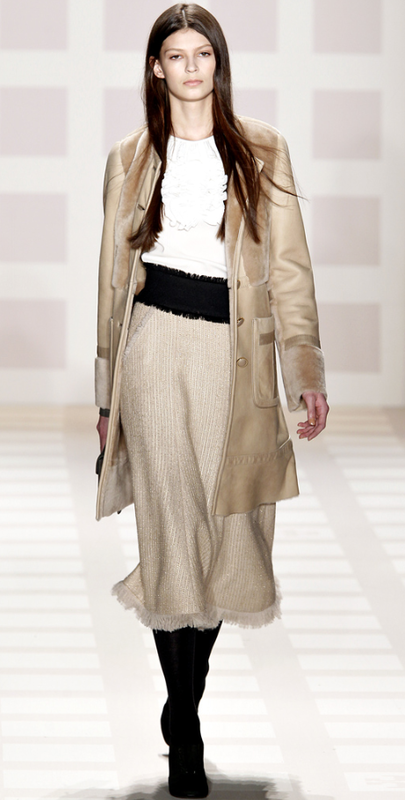 I’m such a fan…adore the shearling skirt!! I love this collection, q! Who doesn’t love Tory though? Thank you for sharing the line with us. Yay for tartan!!! Tartan is always in, but Mrs. Burch will ensure that its hip this fall! When I was young, my mother and I would watch fashion shows all of the time and of course completely critique every outfit that came down the runway. Now I have a son and we watch nature shows instead…the same thrill, but I must say I really miss those days. I am outnumbered over here and I need a girl to even things out!!! Thanks for the great coverage of the New York fashion shows. I have really enjoyed it! The first few were indeed a bit too much pattern for me, individually I like them but not all together. I prefer the last 5 images for sure, lovely (last one is my fav’). I do love palazzo pants but am short and you’re so right, never good. Have tried them a few times but oddly enough, still doesn’t work on me :) I just want them too so much. Tory is absolutely the best at what she does….very affordable, well made, hip sportswear. Love that lace vest…and I don’t usually do lace, either. I also love the ecletic outfit she is wearing in the 1st photo. I know you’re having another fabulous day at Lincoln Center!!! You nailed it perfectly, she is a whiz at creating commercially viable styles, and manages to come up with things *every* season that women will want to wear. Much of it isn’t my cup of tea, but there is always plenty to like, and lust after, she does a stellar job. So happy to be looking at these outstanding photos and reading your thoughts on the varying lines, you do such an incredible job! Love anything plaid, anything Ralph Lauren, and anything Fall. I am a scarf wrapping, knee high boot wearing mom who just loves the crunch of leaves. Wonderful line of fashion! 80 queries in 1.071 seconds.